In December of 1890, prior to the existence of Lansdowne Borough, a fire ravaged a row of stores on South Lansdowne Avenue. In January of 1894 the Borough contracted with the Lansdowne Water Company for 12 fire hydrants. In early December 1894 the Lansdowne Fire Company was organized. Elected as the first president was, Joseph S. Van Sandt, and first fire chief was Joseph L. Lowden. The Commonwealth Court incorporated the Fire Company on November 9, 1897. The original charter was in effect until 1978, when a new corporate charter gave the Company non-profit status. 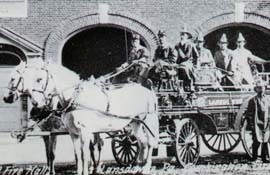 In 1903 the Borough, with the passing of an ordinance, officially recognized the Lansdowne Fire Company. A second ordinance was passed granting the Fire Company an annual budget of $200. The Fire Company began to use Plectron alerting devices in the early 1970’s and has continued to use a personal alerting device for members ever since, along with the house siren that blows during the day to alert members to calls. The first home of the Lansdowne Fire Company was in the tank house of the Lansdowne Water Company at 15 Madison Avenue. In 1903 the Fire Company received it’s “permanent” home at 12 East Baltimore Avenue. The firehouse was in the front part of Borough Hall. As the size of our apparatus fleet grew so did the need for a new building. In 1975 a new engine was purchased, but there was nowhere to put it. This engine spent its first year at the Yeadon’s Fire House. This fact forced the members of the Fire Company to visit the Borough Council. This visit was somewhat successful, as the Borough built an aluminum garage in the lot next to Borough Hall. This building was also known as the "Tin Shed". In May of 1977 a bond issue for a combination fire, police and borough building was narrowly defeated at the polls. In November of 1982 a new station bond passed at the polls. In August of 1983 the Fire Company presented a check to the Borough to add a fifth bay, energy saving skylights and a fire protection sprinkler system to this new firehouse. In 1986 the Fire Company moved into this new “permanent” home. Borough Hall was remodeled into its present configuration and the “tin shed” was torn down. The Fire Company still occupies this building on North Highland Avenue. The first piece of firefighting apparatus owned by the Lansdowne Fire Company was a hand drawn two-wheel hose reel. With the move to a larger station came larger apparatus. In 1904 a horse drawn ladder wagon was added to the apparatus roster. A chemical wagon was added sometime before 1908. A little known fact is that the fire company never owned the horses that pulled the apparatus. A nearby stable at the sounding of an alarm sent the horses, or a team going by the firehouse was commandeered for the duration of the call. Motorized apparatus came to the Fire Company prior to 1914, an American La France chemical/booster wagon. In 1925 two American La France apparatus were purchased, a 750-gallon per minute (gpm) engine and a city service ladder truck. In 1928 an Autocar 250 gpm booster truck was purchased. In 1937 a 750-gpm Autocar engine was housed. This truck was sent to the New York World’s Fair in 1939. 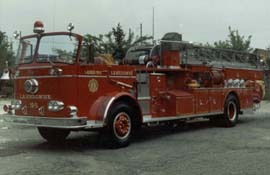 In 1942 a Mack city service ladder was purchased to replace the 1925 American La France. In 1947 a 500-gpm Mack engine was placed in service. The 1937 Autocar was refurbished and recertified as a first out engine in 1953. A 1954 750-gpm engine replaced the Autocar booster. In 1956 a GMC/Christopher rescue truck was placed in service. In 1961 the first aerial ladder truck was placed in service. It was a Seagrave cab forward with an 85-foot ladder, this truck served until 1985. A 1966 1000 gpm engine built by Seagrave was placed in service to replace the 1947 Mack. Also in 1966 an International rescue truck went into service. In 1974 a Chevrolet/Providence rescue replaced the 1966 International. This truck carried the Hurst “Jaws of Life” and was called an Emergency Care and Rescue Unit. A Hahn 1500 gpm engine was purchased in 1975 and was just recently taken out of service. A 1985 Hahn 106 foot ladder was housed in the new firehouse. In 1993 the Fire Company placed in service an International/American Rural rescue truck, and in 1994 a Seagrave 1250 gpm enclosed cab engine was housed. 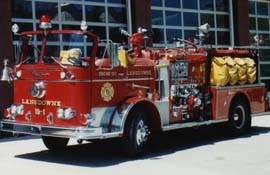 In 2001 the Fire Company received a 1500 gpm engine to replace the Hahn. The Lansdowne Fire Company has a long and distinguished history. Unfortunately this history includes four members who gave their lives in the service of their community. Chief George A. Gowan was the first member to give the ultimate sacrifice. Chief Gowan succumbed to exposure to smoke and the cold on December 29, 1925 after directing firefighters during fire ground operations. The second member to die in the line of duty was Chief Walter Fraim. This unfortunate occurrence was on June 10, 1940. On November 22, 1961 Assistant Chief G. William Joines died of a heart attack at a working fire. Assistant Chief Joines was also a sergeant in the Lansdowne Police Department, and was the third member to pass while serving his community. The fourth and most recent line of duty death occurred when Fire Policeman Norman D. Wilson suffered a heart attack while directing traffic at an auto accident on January 20, 1976. These four members have given the ultimate sacrifice to their community and will never be forgotten. The original Ladies Auxiliary was formed in 1906 with 10 members. By 1914 this group had grown to 35 members. The present incarnation of the Ladies Auxiliary was formed in 1952 and presently has 30 members. These dedicated ladies and the present membership of men and women serving the Borough of Lansdowne as firefighters and EMTs hope to carry this proud and distinguished history long into the future.